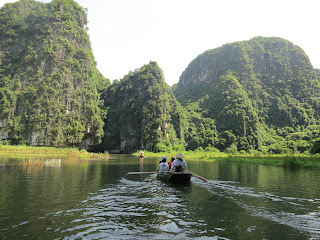 I went on this day trip on a whim, because the museums in Hanoi were going to be shut that day, and it turned out to be one of the nicest trips I've taken. Not Hoa Lu, specifically, though what's left of this ancient capital of Vietnam was a pleasant diversion. 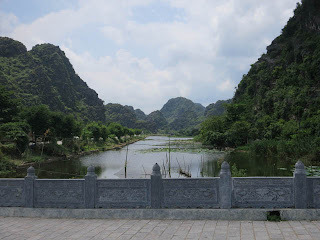 These days it consists of a couple of attractive temples surrounded by mountains and some open areas where the city was. 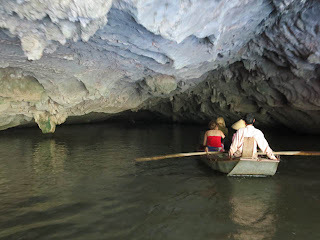 What really made the day, coming completely unexpectedly, was the boat ride along the waterways through the landscape of karst hills, and even sometimes under them. We followed that up with a bike ride, albeit a short one, along a path that would through the rice fields and along the base of the same hills. Keen cyclists shouldn't get their hopes up about the advertised bike ride. It was pretty short. I doubt the boat rowers get paid much money and it's accepted that they will supplement this with tips, attempts to sell you handicrafts and even what is virtually a scam at the far end of the river trip, where you're encouraged to buy drinks and snacks for your rower even if you don't want any yourself. I strongly suspect the rowers sell these back to the snack saleswomen later on for a share of the profit. South gate of the Imperial City, where you pay. The citadel is bigger, extends around it and contains houses, cafes, shops, etc. From the end of the 18th century to the start of the 20th, Hue was Vietnam's capital. I liked it much better than Hoian, even though the food, as several tourists have noted, is far from spectacular. I spent my days wandering around the city, especially the citadel, and the best part of three days inside the imperial city. You have to pay to go in, so it is very nice and peaceful when you get there. I bought two little books, one which explained all the buildings and one that told stories about the lives of the royal family, the concubines and the legends of the Perfume River running outside. Whenever I got too hot from wandering around, I sat on a bench and read for a bit. The imperial city really is a city with streets lined with walls. On the other side of the walls, palaces, temples and theatres are set in gardens with ponds, urns, ornamental plants. There are lots of inscriptions in Chinese and I got a kick out of seeing how many characters I could read (not many). A lot of imperial city was destroyed during the war, so the best surviving buildings are in the outlying sections. A lot of renovation and reconstruction is under way, so perhaps Hue will be even more exciting next time I go there. I always wanted to experience Asia's rainy season, and I have been well served. As people who know regularly explain, it doesn't rain all day every day. What you get is one torrential downpour a day, or maybe every other day. It's actually rather easy to miss them, but here's some pictures from a time I didn't. I had walked to the train station to buy tickets and decided to walk back on the other side of the river under the walls of the citadel. It was sunny when I made that decision. As I crossed the fancy new bridge you can see below, I could see blackness rolling up the river towards me. Luckily, the bridge has been built with shelters. I waited about half an hour until it was only raining about half as hard, then continued my walk. I still got soaked, but it is warm enough that it isn't unpleasant. Two bikers wait for the rain to pass. I'm in a shelter like this one on the other side, with another motorbiker, a cyclist, a couple who were fishing, and a man with a ladder and several paintpots who was touching up the finish on the shelter. If you're in a boat you can always shelter under the bridge. I imagine with rain like this you would have to start bailing out water otherwise!